Speaking to GamesIndustry International, Shigeru Miyamoto clarified Nintendo's position on new IPs versus re-using existing IPs, explaining that Nintendo prefers to create game mechanics first and decides upon the context later rather than purposely setting out to build new series. There are always requests to see Nintendo tackle new topics and release games with fresh worlds and characters, with the company accused of leaning too heavily on popular franchises such as Mario's stable of games in recent times. However, Miyamoto believes that the company does not need to create new IPs unless there's good reason behind them, arguing that many new intellectual properties still rehash ideas. The important thing to Miyamoto is that the gameplay is unique, not the series. [...] Certainly internally at Nintendo we have people on the teams who say, “Wouldn't this be better if we created a new IP around it?” But to me, the question of new IP really isn't whether or not [you have a new character]... I look at it from [the perspective of] what is the gameplay experience in the game you're playing? For a lot of people, they would say if you take an old game and wrap a new character around it, that's a new IP, but that game is still old, and the experience is still old. So what we're doing is we're always looking at what type of new gameplay experience can we create, and that's the same for whether we're playing with one of our existing IPs or we're doing something new. 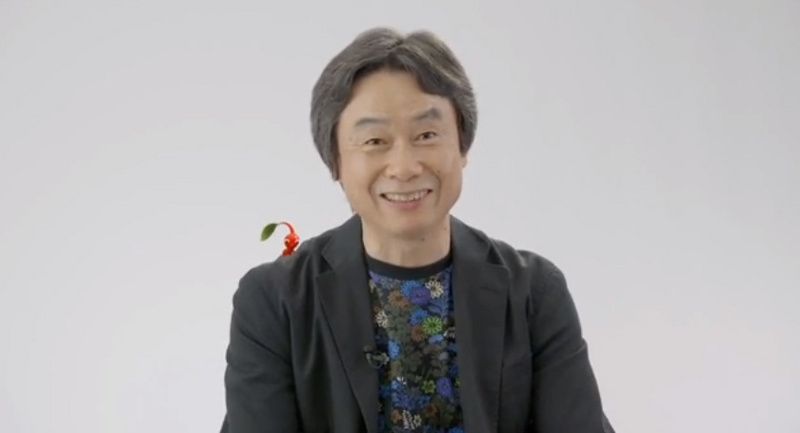 The Mario creator highlights Pikmin as a prime example of when a new series is needed – a gameplay idea that did not fit in with any of the existing franchises at Nintendo's disposal. While designing the game and planning mechanics, the team decided that new characters were needed to take advantage of the idea, and thus the Pikmin were born. So from my perspective, it's not a question of just how can we create a new character and wrap it around an old game and put that out and call it a new IP. It's always about starting with a new gameplay idea and a new experience that's unique from an interactive standpoint and then finding a character that's best suited with that. In some cases, it may be an existing character, and in some cases it may lead us to a new IP at some point in the future. What are your thoughts on Miyamoto's approach to new IPs? For example: KI: U will never be the game it is today if they are just making a sequel of the old games, they are very different! An excisting ip already has a following and generally easier to sell to people. Thats why we get CoD, and other games every year. Difference being 99% of the time Nintendo will take an excisting tweak it, implement new ideas, even take an ip in a slightly different direction at times and make it substantially different from previous itterations. If/When Nintendo comes up with new gameplay ideas that won't fit excisting ips then they do/will create new ip's. What he is saying is so true. Its weird some people don't get this and ask for new IP just for the heck of it. @GiftedGimp Well said, well said. @GiftedGimp I don't get CoD. Ew. Why don't they create a new IP that fits new gameplay? I love Nintendo games but some fresh air is needed. The IP is a badge of quality. If Nintendo uses Mario, you can be sure it is a good, fun game. It there is a new IP it means Nintendo is unsure whether this will work out. Can't disagree with this. I think the thing is that most non-Nintendo AAA games focus so much on story and production, the way to make it fresh is to make a new story and a new world. For Nintendo, which is gameplay centric, the story is mostly unimportant (save the princess) and changing the gameplay is what matters to make it fresh. And I play games for gameplay most of the time, so, hats off to Miyamoto. @DarkCoolEdge That's Miyamoto's point — if they have a new gameplay idea that doesn't fit the current line-up, then a new IP might be made instead. He doesn't want to create new series for the sake of it, the gameplay ideas have to come first. The Pikmin idea needed new IP, then they made Kirby Mass Attack which we refer to in my household as Pikmin Kirby. Its also used in Dream Team it seems. Pikmin should have been winter, SSB or Kart spring, Mario summer, Kart or SSB fall. 1 game a season, not 1 or 2 a year. Also, new IPs don't sell as well. Steel Diver. Nuff said. Funny how i saw no new gameplay experiences either yesterday. @rjejr You know... You might have a valid point, but games are very hard and needs VERY long time to build. Unless it's a simple game. For example, that Luigi's Mansion: Dark Moon game? It needs three years. Three. :T And then people can't count on whatever the hell happens, no funds, people suddenly backed out... Yeah, development can take a VERY, VERY long time. See my point? 3 years in development, means 3 x 12 = 36 months, and we play if for like, 1 month. @Mason I think what Darkedge was meaning was for them to actually do it,create something new that fits a new IP rather than just talk about it.Other than the Wii series and party games the last fresh idea that fitted a new IP was over 10 years ago,at least on home consoles anyway.Correct me if i'm wrong? Yeah, I know. You probably think I'm a mindless fanboy, but personally, I believe with what he is saying. I agree with his outlook on many things honestly, and with him having such a big impact on Nintendo itself over the years, is probably most of the reason why I have always stuck with Nintendo. While its good that they are focusing on better gameplay aspects of older games but new IP are needed. If you don't try a new IP then you will be stuck with the same IP for too long (Its not a bad thing). Having new IP makes thing fresh and can create a new franchises. The Eshop should be the perfect platform for them to try out new ideas and content delivery.Even if it's bringing back forgotten IP's with all new gameplay like with Kid Icarus or even long over due 16 bit sequels in their original style or slightly updated.Its an easier,cheaper and less risky way to gauge consumer interest and with Miiverse there even more so.How about a $10 Waverace or F Zero for example with 3 tracks and online multiplayer already included,then add proper DLC with extra modes and tracks.The majority will buy it at a low entry point and if its popular,keep adding more content.It doesn't have to look spectacular,just be fun and cheap.It keeps there abandoned IP's alive and kicking and gives them more options going into the future. Miyamoto has historically been a "gameplay first" guy - you only need to look up some of his quotes from the 80's and 90's to realize that. While I do agree with him on a general basis, I believe he sometimes gets too ingrained in the gameplay issue to properly contemplate the "metagame" - as in, the circumstances surrounding a game other than playability. Sometimes a great gameplay idea can fail miserably because of any number of factors - bad presentation, bad production value, tired characters, etc. So taking such a gameplay-centric stance can sometimes be to the company's detriment. Now, I don't think Nintendo's characters are tired at all - I could play Zelda, Mario, DK, Kirby, Pokemon, etc pretty much indefinitely. But sometimes the allure of a new IP is needed from a marketing standpoint, even if the gameplay isn't revolutionary, in order to give your customers a greater sense of discovery. Especially given the Wii U's struggles, I would wager right now would be a perfect time for Nintendo to debut a new, exciting IP along with the big guns. Then they need to work on refreshing old franchises! More Kid Icarus! Excite (I loved Excitetrucks)! Earthbound! Advance Wars (how have they overlooked this for the gamepad)! Fire Emblem U! F-Zero! Eternal Darkness! Sin and Punishment! Starfox! Punch-out! Edit: I left out Metroid (we got one not too long ago, but FPA metroid's are where it's at). I'd love to see another game from Last Story's creator. Honestly, maybe if they delayed the oprainfall games to optimize them for the Wii U, the launch would've gone LOADS better. Miyamoto's ideas may not be bad. If there is a new Nintendo IP, then I will look forward to it. He's exactly right. Putting a different character in DKCR wouldn't have made it a different "IP" - it's just nonsense. Miyamoto makes too much sense. Nintendo fans know that the gameplay changes within the well known franchises, many other people just look and say "Oh, they're doing THAT again?" "arguing that many new intellectual properties still rehash ideas"
However, creating new IPs would actually improve Nintendo's image, Miyamoto. Don't want to create new IPs? Start making more mature (and by 'mature' I don't mean lots of blood and cursing...I mean "X" mature) games. Don't want to make more mature games? Start creating new IPs. Gameplay is important but people who do not follow sites like these will say "not again a new Mario" and they go on and buy a PS or Xbox instead. I don't understand why people want a new IP regardless, there are tons of IP's Nintendo has that if they release will consistently keep things fresh, and many have already settled in with the beloved characters in said franchises. Nintendo should copy Sony. Sony has been releasing new IP every so often and they are expanding their variety in the library. So many choices for gamers to pick. If one person doesn't like Ratchet and clank then he has others IP to look forward too. I have seen too many Mario in a short time. Time for a break, plaese. Sony has their own "mario kart" type game and their own "smash bros". What Ninty needs are their own "The last of us" and "uncharted" versions. That is why Sony is doing so well right now. @jacksayspurple NOT 'Nuff said.. Steel Diver IS awesome and I'd buy a sequal in a heartbeat. Very few people who have actually played it, don't like it. @SirMario Well I seen arguments that uncharted is innovative or little big planet is completely original. Mind you, they do involve new features but they're hardly groundbreaking. Uncharted is a fresh story for tombraider style gameplay and little big planet is a sidescroller with a level editor. (to be short) The last Mario game I played was the first Super Mario Galaxy. I look forward to games like Zelda, Metroid, and Retro studios titles. These are the last Mario games of the generation according to their comments a year ago. @Epicnessofme99 I feel part of the trouble is they keep depending on the same few IPs to carry them when the consumer is pleading for many of the distant older ones to be refreshed. We're not always wanting new but different, is the spice of [life] gaming. I see his point. There's plenty of "new IPs" that I've seen released lately that might feature some snazzy new visual and 'wrapping' so to speak, but underneath it all, is just the same old mechanic or style of game that we've seen many times before. On the other hand though, I would love to see Nintendo get some fresh ideas out with the Wii U and 3DS generation. The Pikmin series shows that they're still very capable of coming up with something new that excites even the most traditional of fans. And that's why Mario and company step in for any game when you use a bunch of people. I'd still like to see a stealth game out of Nintendo's stable. I agree with him. Kid Icarus Uprising could have been a new IP, but they decided to revive an old favorite, even if it barely had any resemblance to the original game. I also think that a new IP does not guarantee freshness. And the other way around. Kirby games can be very varied. This is where one of NIntendo's problems lie. They barely did any core new IPs for the Wii and so far, they're continuing that trend for the Wii-U. If they want people to stop criticizing them about "recycled" ideas, etc. they need some new stuff. Heck, they could even bring back Eternal Darkness or do a new Kid Icarus or something besides the usual series'. I love Miyamoto, and I love Nintendo, but this is all just semantics — it's been abundantly clear for some time that many Nintendo fans, despite still enjoying the old franchises, want a spectacular new IP. Period. This means new worlds and characters and stories, not just new gameplay. Besides the commercial viability of established names, there is no reason why Nintendo can't direct the same energy it has devoted to gameplay innovations in recent years (e.g., Mario Galaxy) to crafting new worlds in which to flex those innovations, and new characters to do the flexing. I for one still don't see a compelling reason to buy the WiiU and add yet another gaming system to my living room; based on what they've shown in the past and this week, I can get the same level of fun and the same types of experiences from my Wii and 3DS. Isn't Wonderful 101 their game? Anyways, I don't think the main issue is no new IPs. It's that they aren't using very many of IPs when they have a vast library of IPs that they hardly use (Star Fox, F-Zero, Earthbound (especially Earthbound), Chibi-Robo, etc.). They do rely too heavily on Mario and Zelda, and some of the more recent offerings of those series have been rather disappointing to me. I don't see how Miyamoto's argument explains games like Super Mario Galaxy 2 (which seemed to be more of an expansion pack with minimal new features (Yoshi and a couple of new power-ups) than a full-fledged sequel) and Skyward Sword (IMHO, a complete and utter disaster that was boring, had lame gadgets (a vacuum cleaner? Really? ), awful plot and characters (except for Groose), and only introduced features which detracted from the experience rather than adding (shield gauge. That is all)). And then there was Other M. Yeah, that style sure fit the IP. Just like Star Fox Adventures. Sorry, I like complaining too much. This just came across as making excuses to me. I like this. Miyamoto knows the type of games that I like. I like knowing that the next Zelda is not going to become a racing game. Or a game that is nothing but shooting guns. DRM? Xbox loves it. Contracts? Microsoft (Xbox) has a contract that says that the company that wants to have a game on their system has to make it for Xbox BEFORE releasing it on other game systems. That is why Ubisoft screwed Nintendo and customers with Rayman Legends. Nintendo was always the game company that played "hard-ball". It is why people still think that Indie-style companies have a hard time with Nintendo. It is why SquareSoft fled to PSone. They stopped those practices. And the other companies are becoming worse now than where Nintendo was. I wonder, what would happen if Nintendo tried to "copy" Sony's ideas? @SyFyTy I never said it wasn't a good game. Merely that it didn't sell particularly well. You only need to look at Smash Bros to see Nintendo already has a bunch of IPs. They don't need to make new ones. If they feel it's necessary, just revive an old one like Kid Icarus. People can't complain about wanting a new F-Zero AND a new IPs too. Use what you already have. Nintendo actually has that variety your talking about, even if they don't always use it. The thing with Sony is they didn't actually have very many of their own IPs back in the day, so they're trying to build the kind of library that Nintendo has had since the 80s to build up in a much shorter period. You could also argue that the more IPs you have going at one time the harder it is to balance your resourses between them. I definitely have to agree with Miyamoto here. A new IP doesn't necessarily make a game better, after all would Pokemon Mystery Dungeon or Mario Kart have been better games if they didn't have Pokemon or Mario in them? I think it was more of a leaf blower than a vacuum cleaner, but yeah, kind of lame. Skyward Sword was one of my least favorite Zelda games, which still doesn't make it that bad of a game since most Zelda games are amazing. I appreciate where Miyamoto is coming from and love the many game play innovations Nintendo has made, but I wish they would focus on story and characters more in some games. My favorite games combine fun game mechanics and great characters and story that draw you in. For me Majora's Mask did this brilliantly. @LDXD - I respect Nintendo a lot. But I could respect them a whole lot more if they got their games out sooner rather than later. I know it takes a long time to develop games. I'm a big JRPG fan and those games only come out every 3 years it seems. So, Nintendo knows they have a new console coming out. Nintendo knows it takes 3 years to develop a new game. So why does it seem like Nintendo waits until 2 years before the system comes out to start making games for it? Also, along the new IP front. There is part of me that thinks Nintendo stopped making new games w/ the Gamecube. But there is part of me that knows they actually did have new IPs w/ the Wii. Problem is new Wii IP were along the lines of Wii Sports, Wii Fit and Wii Music. So yes, Nintendo has been developing new IP all this time, problem is they are games for our parents, not for us. @sanderevers Im thinking more of something on the vein of Portal. Not necessarily a shooter, but I want to see Nintendo going somewhere new in that area they have explored the least. I really like this. Nintendo doesn't just create random new IPs, they make new ones when they need new ones. Great words, Miyamoto. @Savino I disagree with you.